Series "agraf" is the metal hose with the increased durability with Д1 type of lock, is designed for the protection of telephone and other wiring from mechanical damages, and can be applied in other protection systems. It differs from the P3 metal sleeve type with the special lock version, which increases the rupture strength. Lock construction schemes of the metal hoses. * - coils of metal hoses with the length of 50 m are produced on individual order. 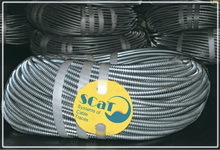 * - coils with metal hose with 50 m length are produced on the individual order.